Source: Spanish-American War Monument, Durham. Photo courtesy of G. Kueber, http://www.opendurham.org. The marker stands roughly seven feet tall. One side of the marble shaft shows a pair of crossed flags, the American flag and the North Carolina flag. On the other side is a pair of crossed muskets and various soldiers’ supplies. The top bears two small cannons flanking a large drum. The monument was proposed to honor Privates Matthew Barbee, who died in a train collision, and Rufus V. Stem. One stone was provided by shipmates from the USS Massachusetts. Barbee and Stem are buried at the site. The 1st North Carolina Volunteer Infantry served in Cuba as part of the occupation forces following the cessation of hostilities. Company I was from Durham County. The Treaty of Paris was signed on December 10, 1898 formally ending the Spanish American War, and the Infantry arrived in Havana the following day. The troops returned to Savannah, GA in March 1899. The 3rd North Carolina Volunteer Infantry also had a regiment of African American soldiers. Company H was led by Captain William Peyton Smith. The city established Maplewood, in the West End area between Duke University Road and Morehead Avenue, in 1872. It covers 119 acres. The grave is located south of the intersection of Kent and Jackson Streets in the cemetery. Several large trees and many other graves surround the marker. 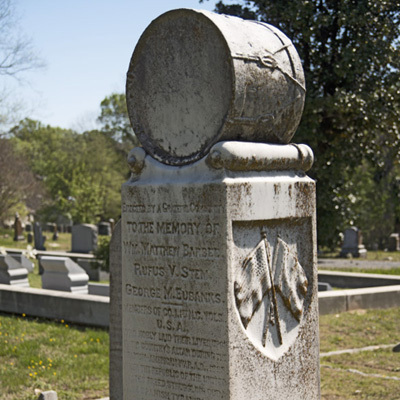 Local historians occasionally offer monument tours in Maplewood Cemetery. Local American Legion veterans hold Memorial Day ceremonies at the cemetery, including wreath-laying, the firing of a 21 gun salute, and the playing of Taps.